I still permit myself a plate of pasta on special occasions when we’re eating out, but the noodles have to be fresh and homemade. If I’m going to cheat, faux pasta made from lentil flour and topped with nutritional yeast isn’t gonna cut it. On all of the other occasions I catch a craving for a rich meat sauce or a fresh lemony scampi, I turn to plant pasta. I have to be honest here. You’ll taste the difference between zucchini noodles and traditional pasta. Don’t compare the two. Hey, you wouldn’t go to a Tiny Fey movie expecting a Meryl Steep performance, so don’t feel disappointed if your plant pasta doesn’t exactly scratch the same itch as the glutinous variety we know and love. On to the good news! Plant pastas taste delicious, seriously. Just as a bowl of plain noodles wouldn’t taste all that great on its own, a bowl of zoodles needs some additional love and attention to make it a crave worthy dish. I love thin ribbons of yellow squash topped with a creamy Beef Stroganoff sauce. A piece of seared fish over a pile of zucchini noodles with lemon and olive oil always hits the spot. Almost all of your favorite comfort foods can be amended to includes plants instead of pasta with a couple of inexpensive tools, an open mind, and a little bit of creativity. Follow me and I’ll walk you through how you can start lightening up your old standbys with healthy, veggie alternatives. 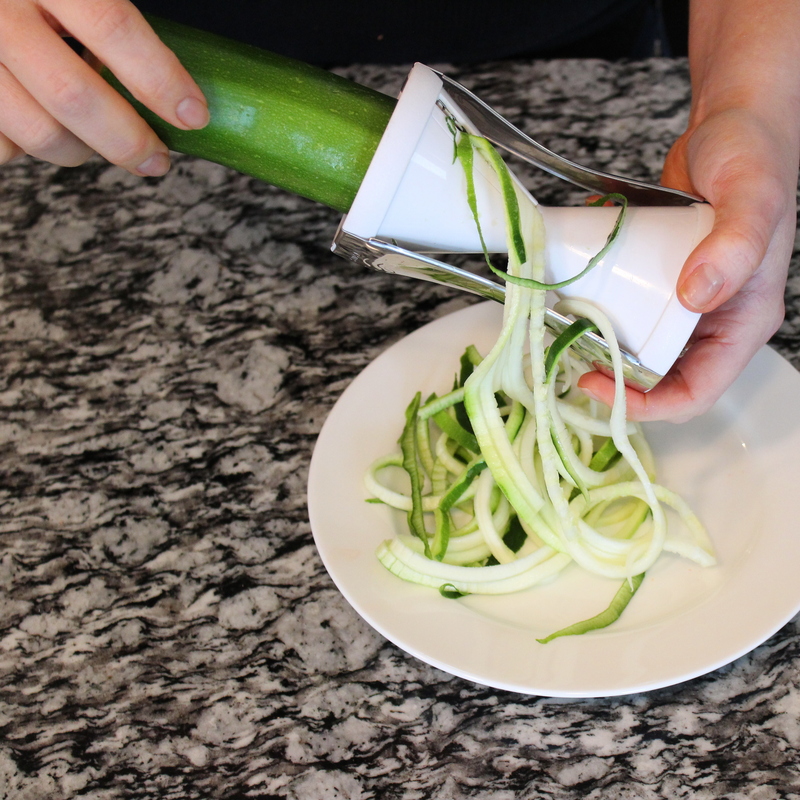 Something to make short work of processing your favorite veggies into your favorite noodles. You’ve got a few options here. 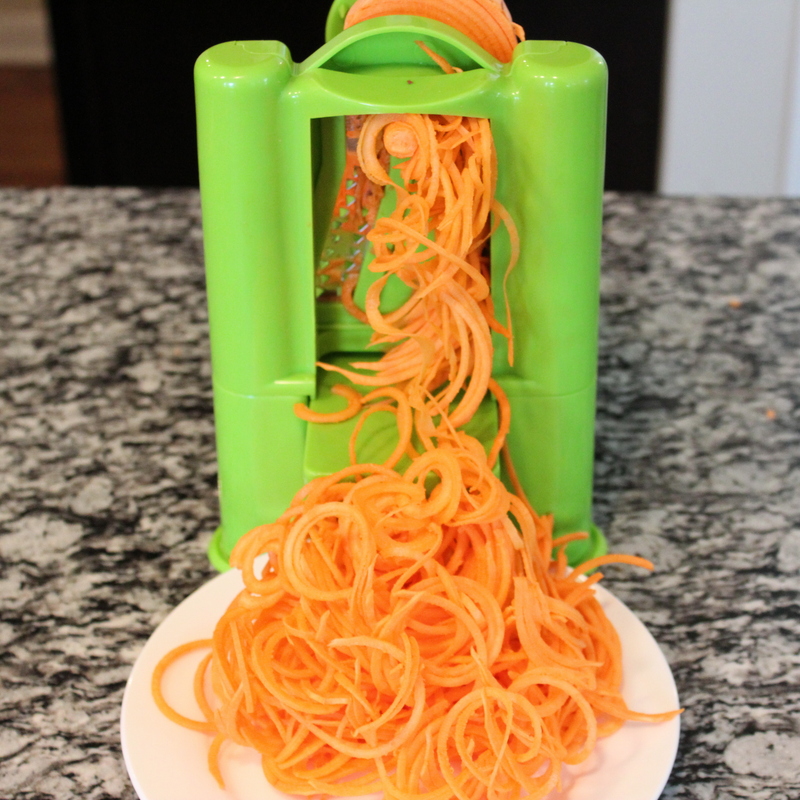 I use a full-on, mac daddy spiralizer for when I’m spiralizing a ton of veggies or when I want to make noodles out of hard, dense produce like sweet potatoes or carrots. My tried and true Veggetti is less expensive, more compact, and certainly easier to store and clean. I use it most often. It’s perfect for softer veggies like squash and zucchini. Last but not least, a simple peeler works wonders in creating wider strips of veggies that mimic a fettuccini or pappardelle noodle. I use my peeler to make long, thin strips of carrots for a raw salad or on yellow squash to make noodles to soak up my Beef Stroganoff sauce. First, think about what kind of pasta you’re looking to replicate, and then, based on my advice above, choose your weapon. Wash and dry your plant pasta of choice. Most veggies don’t need to be peeled before spiralizing. I make an exception for sweet potatoes and sometimes carrots though you don’t have to. Next, cut off the ends of the vegetable to be spiraled. Whether you’re loading it into a large, spiralizing contraption, using the Veggetti, or working with a peeler, be sure to get a strong, stable grip. 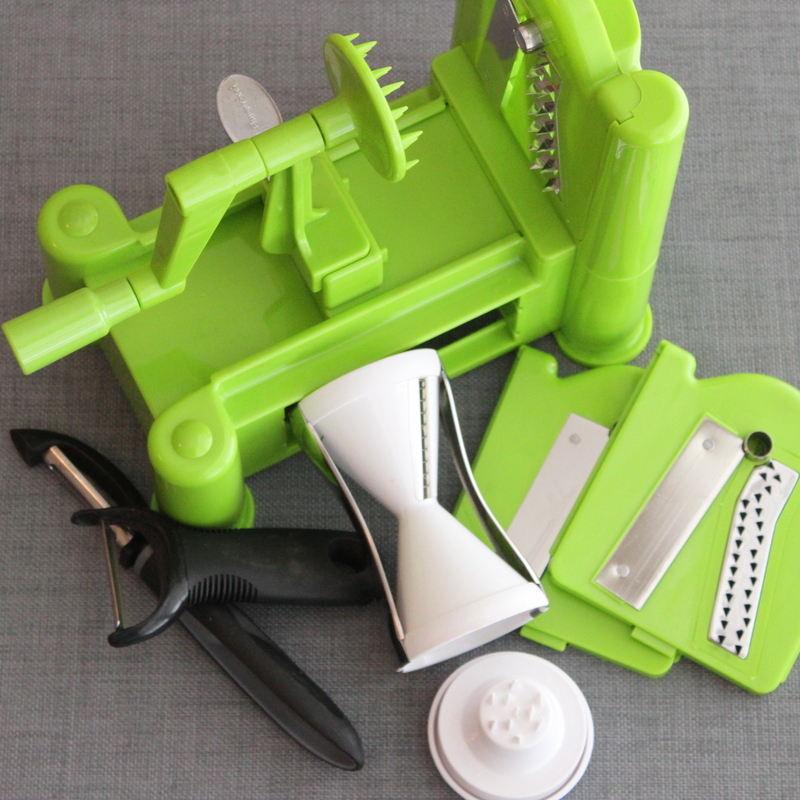 Spiralizer: Every device is different so be sure to read your instruction manual. The important tips to remember here are to choose the right blade for the right job (they vary in the size and shape noodle each creates), and make sure your veggie is secure in its holder. Turn the crank clockwise and catch your spirals with a plate below. Veggetti: Simply insert the soft-fleshed veggie into one of the open ends (one side produces thin noodles and the other thick ones) and turn clockwise. Clear our any seed debris before moving on to the next piece. 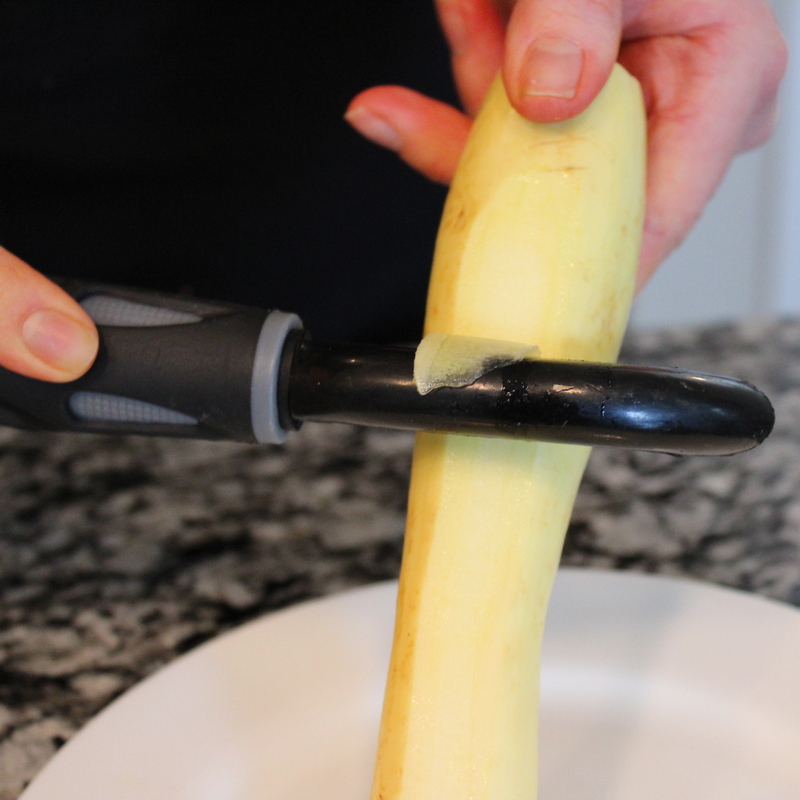 Peeler: I like to keep a regular potato peeler as well as a larger veggie peeler on hand. The potato peeler makes thinner noodles while the larger peeler produces wider ones. Start at the top and drag the peeler down the length of the vegetable until you’ve reached the other end. Rotate the veggie as you work to ensure uniform peels. Substitute plant pasta for wheat or other grain varieties if you’re Paleo, adhering to the Auto-Immune Protocol, finally giving Whole 30 a whirl, or simply trying to eat more vegetables and make lighter, healthier meals. They can be adapted to fit any cuisine and while they’re not going to trick you into believing you’re eating a bowl of Mama’s famous spaghetti and meatballs, you’ll probably feel waaaay better after eating them. 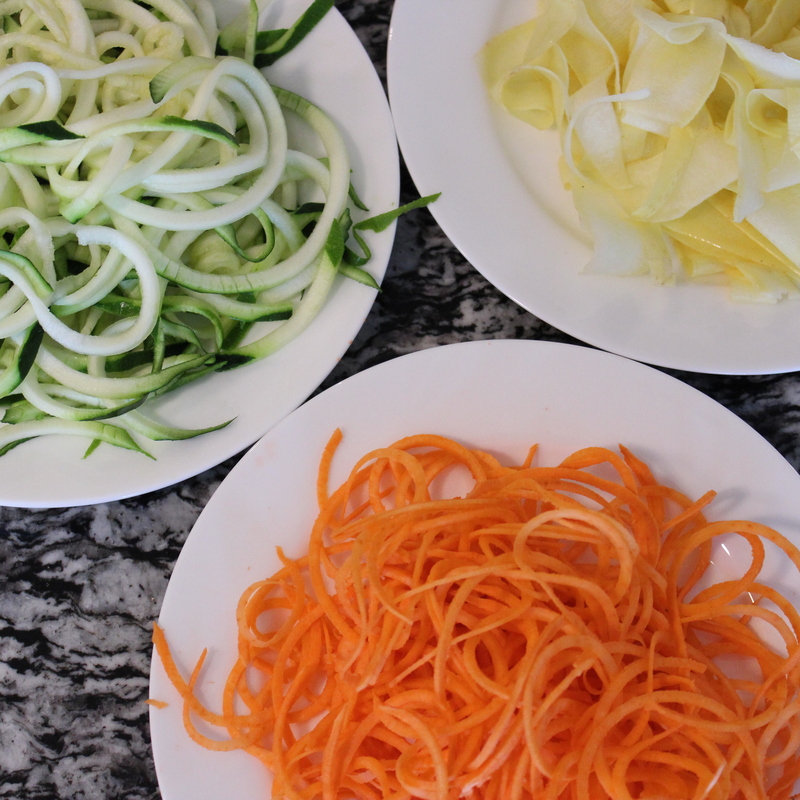 Ready to get spiralizing?! Amy Burns the Recipe Book is linked through Amazon to allow you to quickly and easily purchase all of the tools I use to make delicious, healthy plant pasta. Thanks for the tips. Great read. Thanks for the gluten-free pasta recommendation, Patti! I’ve struggled to find a good one too. Give the plant pasta a whirl. It’s definitely a different taste and texture, but with a good sauce, it satisfies my pasta cravings.